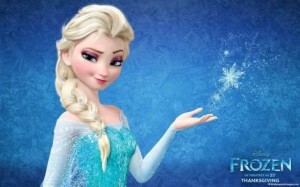 “Frozen” is becoming one of the most popular movies of all time. It’s already the biggest-grossing animated film ever. The Walt Disney Company, which owns it, just announced profits soared 27% in the quarter, thanks to “Frozen.” The movie has already brought in three-quarters of a BILLION dollars, and Disney says it’s only just beginning to see the benefits of the brand. And then there’s that song. “Let it go” won an Oscar and made Billboard’s top 10. But what might be more important is my wife’s observation– it seems to be the “go to” song for millions of children today. Now, I’m pretty sure “Frozen” would have been a popular movie without “Let it go,” but the song has helped catapult it from merely successful…into filmmaking history. And that’s an important lesson for you in your efforts at “getting noticed” in the media. Lots of people have great ideas that are worthy of media attention. But those that stand out with a unique “hook” are the ones that have the best shot at making it big. Media people call that having a “take”– something that makes you stand out from all the rest. So what is your “take”? What is your “Let it go”– the unique song that turns you into a blockbuster performer? Know that and you are well on your way to “rise like the break of dawn” in the media world.